For the first time in history, the tools for cooperating on a global scale are not solely in the hands of governments or institutions. 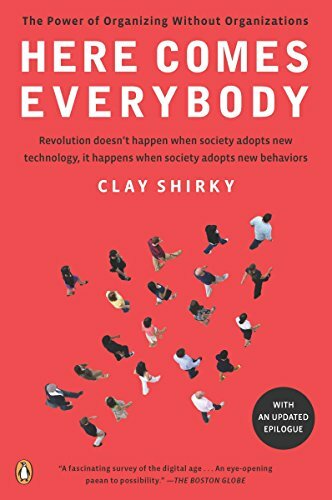 The spread of the internet and mobile phones are changing how people come together and get things doneâand sparking a revolution that, as Clay Shirky shows, is changing what we do, how we do it, and even who we are. Here, we encounter a whoman who loses her phone and recruits an army of volunteers to get it back from the person who stole it. A dissatisfied airline passenger who spawns a national movement by taking her case to the web. And a handful of kids in Belarus who create a political protest that the state is powerless to stop.Â Here Comes Everybody isÂ a revelatory examination of how the wildfirelike spread of new forms of social interaction enabled by technology is changing the way humans form groups and exist within them.Â A revolution in social organization has commenced, and Clay Shirky is its brilliant chronicler. About: Evaluates the significant role of technological advances on the formation and experience of modern group dynamics, citing such examples as Wikipedia and MySpace to demonstrate the Internet's power in bridging geographical and cultural gaps. About: An extraordinary exploration of how technology can empower social and political organizersFor the first time in history, the tools for cooperating on a global scale are not solely in the hands of governments or institutions.